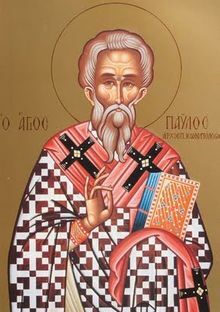 Our father among the saints Paul the Confessor or Paul I of Constantinople lived during the fourth century, and served as Archbishop of Constantinople during three periods: from 337 to 339, from 341 to 342, and from 346 to 351. The Arians, led by the Eastern emperor, Constantius, revolted against the election of Paul to his see. Emperor Constantius held a council, banishing Paul and electing in his stead Eusebius of Nicomedia. Eusebius also banished other Orthodox bishops to Rome. After Eusebius died, Paul returned to Constantinople. Although he was greeted warmly by the people, Emperor Constantius once again banished him to Rome. The Western emperor, Constans, returned Paul to Constantinople with a threatening letter to his eastern co-ruler, resulting in Paul's reinstatement as archbishop. After Constans was murdered in a palace coup, Paul was banished again, but now to Cucusus in Armenia. There, celebrating the Divine Liturgy, Arians came upon him and strangled him with his omophorion. In 381, Emperor Theodosius the Great transferred St. Paul's relics to Constantinople. Nearly a thousand years later, in 1326, they were further moved to Venice. This page was last edited on December 6, 2012, at 00:20.